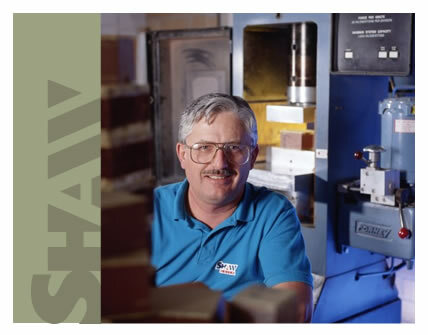 In the early 1990s, The Shaw Group recognized that most of its existing products or markets were in their mature phase, or tied into the construction industry's traditional cyclic pattern of activity. To help keep the company prosperous, we expanded our vision and developed a three-prong diversification strategy. The Shaw Group is one of Eastern Canada's leading natural resource manufacturers and community developers. With a strong focus on products for the construction industry, they compete in a variety of market sectors and produce close to 1,000 individual products in facilities across New Brunswick and Nova Scotia. Six retail Shaw Centres and more than 300 dealers sell Shaw Group products. The company operates on a decentralized basis through a number of divisions and subsidiaries and a joint venture: Shaw Brick, Shaw Precast Solutions, Shaw Resources, Clayton Developments Limited, MMH Prestige Homes Limited, Shaw & Shaw Ltd., and VenRez Products Limited. The Shaw Group has grown brick by brick from its beginnings in 1861 as a small Hantsport, Nova Scotia clay and tile manufacturer. Known then as Robert Shaw's Brick Works, this firm constructed a solid foundation from which to expand and grow by taking the brick -- a building product as old as time, and developing new uses and new users. The ensuing years saw many changes. Seeing potential in related markets, the company, then known as L.E. Shaw Limited, seized opportunities to expand its ability to provide high quality products and services. Brick and concrete materials production was augmented by resource materials, real estate development, and transportation. To reflect growing diversity L.E. Shaw Limited became The Shaw Group Limited in 1993, and continues to demonstrate success through change, developing and refining an extensive stable of products and services based on today's needs. The company's traditional market area of Atlantic Canada has grown to include all of North America. In recent years they have also exported to Japan, China, Sweden, and Germany. Each Shaw Group operation is a leader in its own field and prides itself on staying ahead of the competition. Shaw's management team continually seeks new markets for each of the company's existing products. They also welcome innovative opportunities that enable them to diversify and build on their corporate strengths, particularly where there is substantial export potential. Shaw Brick is an Atlantic Canadian-based manufacturer of quality clay masonry and concrete landscape products. Building on a tradition established in 1861, Shaw Brick continues to blend traditional values and innovative solutions to offer a variety of durable landscape products that add elegance and appeal to any outdoor living space. The versatility and array of shapes, colours, and patterns available in driveway and walkway pavers, garden walls, landscape walls, and retaining wall systems represent unlimited design possibilities. Offering a vast range of superior clay brick and an ever-growing product line, Shaw Brick continues to be the preferred choice of engineers, architects, consultants, dealers, and contractors. Shaw Precast Solutions is Atlantic Canada's premier manufacturer of quality precast concrete products for highway, sewerage, and heavy civil construction projects. The highest quality concrete pipe and manhole products are the backbone of the business, but recent innovations include the BEBO Arch System and the CDS Stormwater Treatment system. The company's investments in the latest technologies result in a wide array of products and services that keep their Shaw Precast Solutions at the forefront of the construction industry. Contractors throughout Atlantic Canada consistently choose their products. The company has extensive capability in the design and manufacturing of "specialty" products and prides itself on partnering with clients to create quality construction products at a fair price. Operating primarily in eastern Canada and northeastern U.S. markets, Shaw Resources extracts, processes, and markets industrial minerals for commercial, industrial, and retail markets. Over the past dozen years, they have successfully expanded their industrial markets, while moving aggressively into the consumer sector, with products that include children's play sand, pelletized lime, landscape stone, ice control products for the winter, and cat litter. The company occupies dominant market positions in many of their major product lines including sand blasting abrasives, fly ash, and wood pellets. Prestige Homes has a long and distinguished history as one of Canada's leading factory-based building companies. Currently one of the largest home builders in Atlantic Canada and with a network of builders across the Maritimes and in the Northeastern US, Prestige Homes employs the latest equipment, systems, and technologies to constantly improve their construction process and advance the quality of their homes. Based out of Sussex, New Brunswick, the company is the originator of the "mini-home" and the builder of Atlantic Canada's first "EnviroHome." Prestige prides itself on timeliness, efficiency, and quality assurance. Their homes are exported all over the world, including Germany, China, and Japan. They also work on larger commercial projects including multi-family complexes, apartment buildings, hotels, and educational facilities. Clayton Developments Limited, a full-service real estate development company, has been involved in a variety of residential and commercial projects throughout Atlantic Canada. Its residential projects range from apartment buildings to fully developed mixed density communities. Since 1959, the company has established itself as the premier community developer in the Maritimes. They have created housing for over 60,000 people while producing in excess of a billion dollars in developed real estate. Clayton believes it is their commitment to quality that is the foundation of their success. Protective covenants, architectural controls, and stringent design standards ensure Clayton communities are beautiful, safe, and environmentally friendly. Ven-Rez Products has been manufacturing school, institutional, and library furniture for over 60 years. They offer a wide range of metal, wood, laminate, and upholstered furniture. The institutional market demands durable furniture and Ven-Rez is unmatched in this capability. Robotic welding, double strength bracing and connections, heavy gauge steel, and unique engineering all contribute to their extraordinary durable products. The manufacturing facility is located in Shelburne, Nova Scotia with easy access to international shipping facilities. The company supplies markets in North America, Africa, and the West Indies. Our operations have grown considerably in the last 25 years. Each aspect of this growth has been carefully planned to build on our corporate strengths - expertise in natural resource-based development, manufacturing, and project management. Our aim is always to add as much value as we possibly can to any resource we use so that the region retains the maximum economic value and employment benefit.